Following yesterday’s huge Nintendo reveals, Nintendo provided an update list of their games that have sold over 1 million units and despite Snipperclips, Super Bomberman R and 1-2-Switch all being exclusive launch titles for Switch, neither of them made it onto the list. “1-2-Switch, which was also released at the same time as Nintendo Switch, is likewise on track to ship one million units very soon. “The Legend of Zelda: Breath of the Wild was released simultaneously with the Nintendo Switch launch, and has helped to drive system sales. It has gotten outstanding reviews not only from the consumers who purchased this title but also dedicated game magazines and all kinds of review sites. Together with the Wii U version, sell-through topped three million units worldwide as of the end of March. By averaging our global sales numbers, we know that close to 90% of all consumers who purchased Nintendo Switch also purchased this title. Looking at these software sales trends together with Nintendo Switch system sales, we can see that sell-through will continue to grow. This high of an attach rate is more or less unprecedented, and we anticipate that this momentum may lead to a new sell-through record for the entire The Legend of Zelda series. 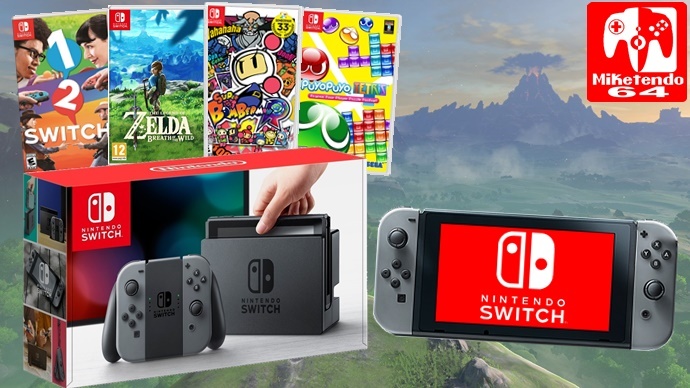 By listening to what players are saying and looking at the circumstances surrounding their actual play, we are finding that a growing number of consumers who do not usually play dedicated video game systems are purchasing Nintendo Switch to play this title or are taking an interest in doing so. By leveraging this opportunity, we sincerely hope to be able to reach consumers who have never played a game in The Legend of Zelda series before. To put it simply, the four launch titles have done spectacularly well for the recently launched console and Nintendo believe their performance will only get better as each title secures even more sales, as more consoles make their way to the hands of their new owner and that is fantastic news. But Nintendo are not putting all their eggs in these four baskets as they do have a great array of titles launching all throughout this year and among them is Mario Kart 8 Deluxe and it is out today and if you didn’t get it, there must be something wrong with you! But if you’d rather save the cash, ARMS is due out in June and Ultra Street Fighter II: The Final Challengers is out in May. Which fighter game takes your fancy? Let us know!